Blodgett’s father, a patent attorney for General Electric, died shortly before she was born. In the wake of her husband’s death, Blodgett’s mother moved the family to France, allowing Blodgett to quickly gain fluency in French and competency in German. The family moved back to New York City in 1912; following high school, Blodgett attended Bryn Mawr College. In her senior year of college, Blodgett visited General Electric to inquire about prospective jobs. Irving Langmuir, a staff chemist, urged her to earn an advanced degree. After graduation from Bryn Mawr, she attended the University of Chicago and wrote her master’s thesis on the chemical absorption properties of gas masks. In 1918 Blodgett earned her degree and was hired by Langmuir’s research laboratory – the first woman hired by General Electric. She improved their light bulbs and co-authored two papers that advanced the company’s research by 1924. Limited by her gender and her degree, Blodgett sought a doctoral degree to advance her career. She graduated from Cambridge University in 1926 – the first woman to hold a doctorate in physics from the institution. Blodgett returned to GE to work for Langmuir, who had received a Nobel Prize in 1932 for his work on tungsten filaments and monomolecular coatings (the oily compounds that create a film on the surface of water). Blodgett pushed his research further, experimenting with dipping metal plates into solutions – and was the first to observe that not only were molecules attracted to the metal, but that they deposited themselves layer by layer on the metallic surface. She published groundbreaking articles on her discoveries; today, these layers are known as LB (Langmuir-Blodgett) films. In 1938 Blodgett began experimenting with glass. She discovered that applying layers of molecular film to glass would make the surface ‘invisible’ to the human eye because the film canceled out the light reflection without compromising the transparency of the glass. That same year, Blodgett received her U.S. patent for “Film Structure and Method of Preparation” for her ‘invisible’ glass; the first of four patents received for her research. Her contributions to research in this field led to the application of glass surface film to optical equipment, windshields, picture frames, and other glass products. During World War II, Blodgett’s research shifted towards defense applications. She aided in the improvement of gas masks, developed a machine to protect soldiers in combat by creating larger and longer lasting smoke screens, and researched methods to reduce the hazard of icing on airplane wings. Following the war, Blodgett developed a device to measure humidity in the atmosphere for the Army Signal Corps, and collaborated on a project studying cloud seeding (introducing dry ice and iodine into clouds to activate precipitation). Blodgett’s work in surface chemistry earned her: several honorary degrees, including one from Brown University; a listing in American Men of Science, a directory of notable North American scientists; an American Association of University Women’s Annual Achievement Award; and the prestigious Francis Garvan Medal for women chemists from the American Chemical Society. She was the only scientist honored during Boston’s First Assembly of American Women of Achievement. June 13, 1951 was declared Katharine Blodgett Day by the mayor of Schenectady in honor of her civic and professional contributions. After retiring from GE in 1963, Blodgett spent her time gardening, collecting antiques, and playing bridge. She died in her home on October 12, 1979. 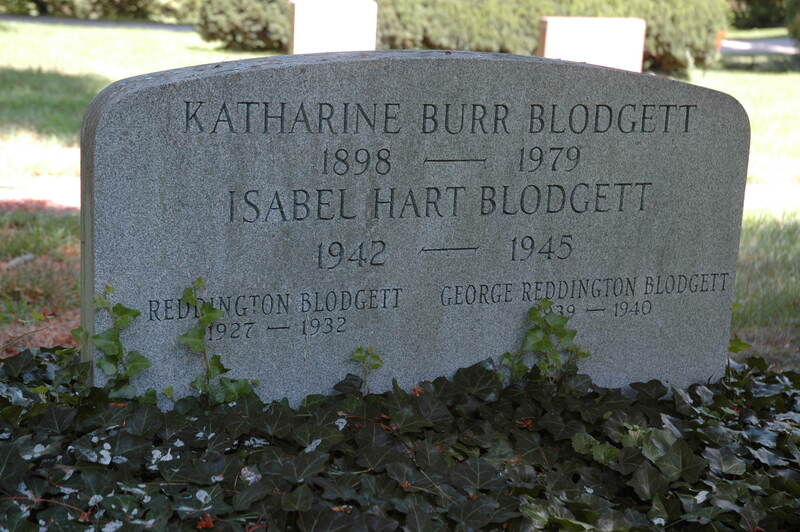 Katharine Burr Blodgett’s grave can be found at Lot #9243, Begonia Path. Adapted from the research of Jill Graboski, as published in Mount Auburn’s January Birthday: Katharine Burr Blodgett, 2004. A fascinating woman and clearly a pioneer as a woman scientist, but who were the three children buried with her? Were they hers or a niece and nephews? Was she also a pioneer in single parenthood? Katharine never married and did not have any children of her own. She is buried with her nieces and nephews. Why is there nothing of Blodgett’s personal life in this account? The grave marker indicates three Blodgetts who died in infancy or childhood. Are they Katherine’s children, and then who was her husband/partner? Can anyone supply information about her family life? 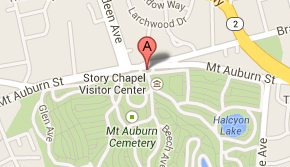 And how did she come to be buried in Mt. Auburn? Blodgett did not leave any personal letters or records, which is why we know little about her personal life; information about her scientific achievements is abundant. Katharine never married and did not have any children; she is buried with nieces and nephews. She lived in a Boston marriage with Gertrude Brown for many years, and later, Elsie Errington.